Sales have grown nearly four times faster this year for private-label products than for national brands, according to consumer market researcher IRI. 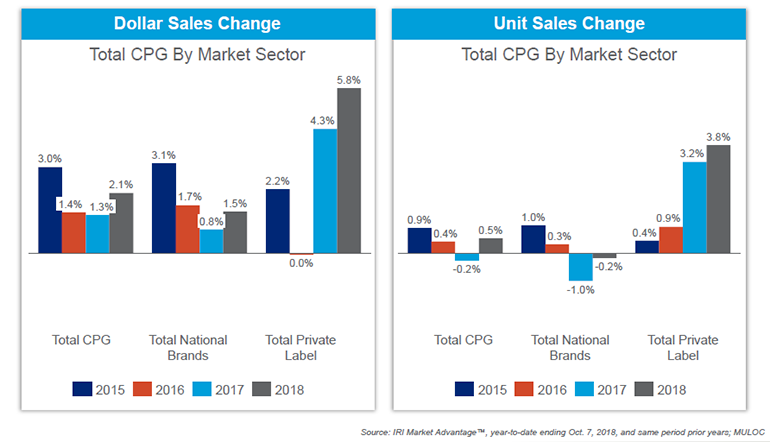 The IRI Private Label 2018 report, released yesterday, said private-brand dollar sales across the food, drug, mass, dollar and club retail channels (excluding Walmart) climbed 5.8% in 2018, compared with 1.5% for national brands and 2.1% for the overall consumer packaged goods (CPG) sector. 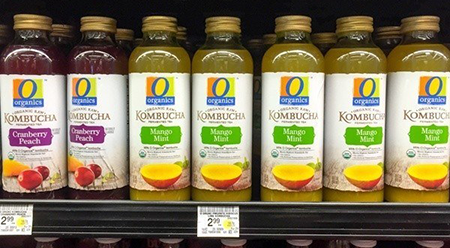 Unit sales rose 3.8% for private label this year, while national brands saw an 0.2% dip in unit volume and the total CPG market managed only a 0.5% year-over-year gain, the study said. In recent years, the dollar and mass/supercenter channels have seen a volatile performance in private label, whereas other retail segments have generally trended upward, IRI noted. Grocery, though, has underperformed in private brands over the past year, with sales up just 1.2% in dollars and down 1.7% in units. Total CPG sales in the grocery channel fell 2.1% in dollars and inched up 0.5% in units, with national brands up 1.5% in dollars but declining 0.8% in units. For the 52 weeks ended Oct. 7, private label spending per buyer in grocery was $447.70, up 0.9% versus a year earlier, according to the IRI study. Dollars spent on private brands per trip dipped 0.3% to $11.50, while the number of private-label trips per buyer came in at 39.1, a gain of 1.2%. Club retailers led in private-label performance during the past year, with increases of 5.9% in dollars per buyer, 2.5% in spending per trip and 3.3% in trips per buyer. Dollar stores saw year-over-year decreases across the board in private brands, including in dollars per buyer (-1.2%), spending per trip (-0.3%) and trips per buyer (-0.9%). Other retail channels had mixed results during the period. Mass/supercenters were down in private label spending per buyer (-2.4%) and trip (-5.1%) but up in number of trips (+2.9%). Meanwhile, drugstores saw a significant decline in trips per buyer (-6.2%) for private brands despite increases in dollars per buyer (+0.2%) and dollars per trip (+6.8%). Grocery product categories with strong private label growth during the 52-week period include frozen food (+7.2% in dollar sales, +6.3% in unit sales), refrigerated food (+7.1% in dollars, +4% in units) and beverages (+5.9% in dollars, +5.1% in units), according to IRI’s research. Some nonedible categories also have seen above-average sales performance in private brands, including general merchandise (+7.6% in dollars, +2.5% in units), beauty (+4.7% in dollars, +6.6% in units), health care (+4.2% in dollars, +5.2% in units) and home care (+ 5% in dollars, +1.3% in units). At brick-and-mortar stores, the fastest-growing private label product segments in dollar sales were egg substitutes (shelf-stable), refrigerated lunches, ice substitute, paper baking cups, baby gifts/toys/furniture, lard, smoking accessories, deodorant, pest control and wine, the report said. Fast-growth categories on the e-commerce side in private brands, by dollar sales, included aseptic juices, batteries, culinary, frozen soups and side dishes, frozen process poultry, cotton balls/swabs, sleep remedies, evaporated/condensed milk, refrigerated spreads and milk flavoring/cocoa mixes. For shoppers, value remains a key draw for private label. Eighty-three percent of consumers surveyed by IRI said they buy private-brand products to save money, and 73% try new, lower-priced brands to save money. Also, 68% of shoppers see private label as a better value than national brands. Still, Susan Viamari, vice president of thought leadership for Chicago-based IRI, noted that dollar savings is just one part of private label’s appeal for consumers. Indeed, 76% of all shoppers polled see private brands as being as good in quality as national brands. Private label selection, too, is key to consumer decisions on where they shop, IRI’s study revealed. For example, 77% of shoppers want a store to have a good assortment of private label food and beverages, followed by home care (62%), health care (59%), personal care (57%), beauty (45%) and pet care (34%). 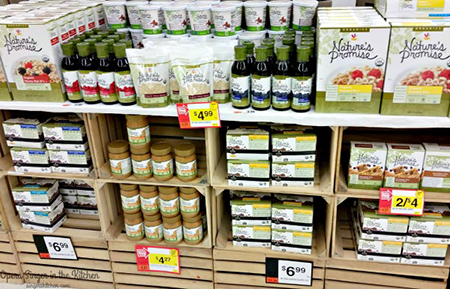 Millennials especially hold a favorable view of private label products. Seventy-six percent said private-brand quality is as good, and 73% think the value is better than national brands. Also, 92% of Millennials said they buy private-label items to save money. Overall, two-thirds of consumers told IRI they plan to purchase more private label products in the next six months. Among Millennials, 73% of respondents said they would do so.